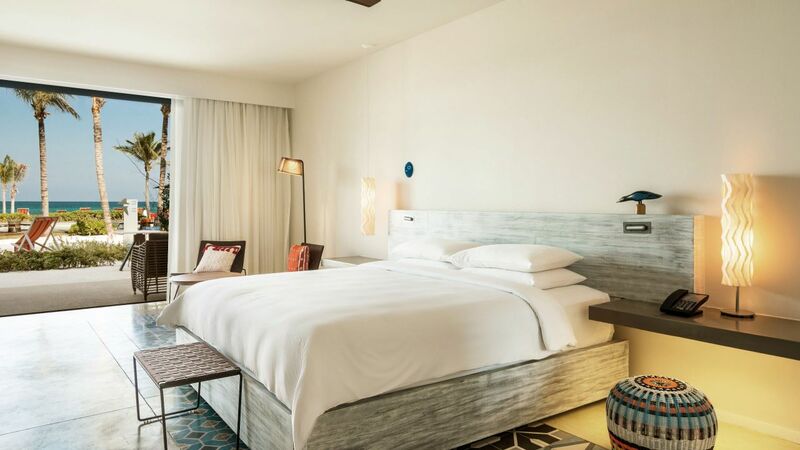 The guestrooms and the Riviera Maya suites at Andaz Mayakoba are inspired by nature with open layouts and a color palette reflective of stone, sand and water; they are flooded with natural light and feature bright pops of color and refined Mayan decor. The grandiose Presidential Suite spans 4,575 square feet across two floors, including a large ground floor living area and dining area. One bedroom is located on the ground floor featuring a private balcony and bathtub. 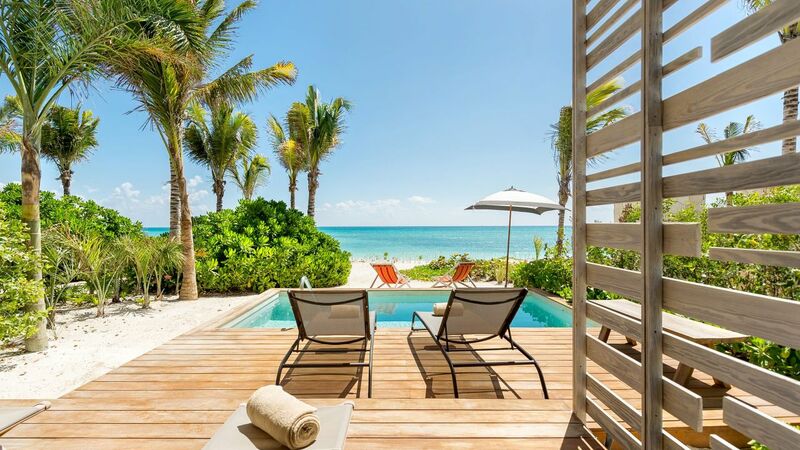 The large ground floor private terrace overlooks the turquoise waters of the Caribbean Sea and has a small private pool, separate dining area, and a hammock where guests can relax comfortably while listening to the soothing sounds of the adjacent ocean. The second floor features one bedroom with a private balcony and a separate terrace with an exclusive whirlpool. This is a premium suite. See World of Hyatt program terms for upgrade eligibility. 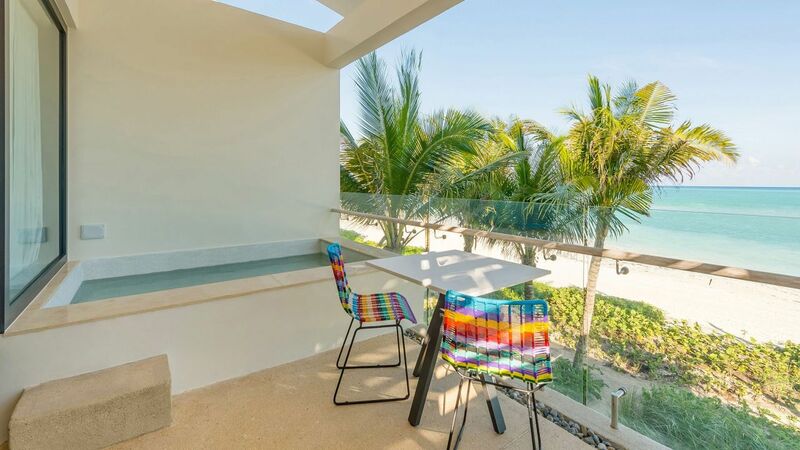 Located just a short walk from the beach, the 1,100 square feet stylish Beach Suite includes one king size bed, expansive bathrooms and separated by two doors from the living area. The suite has lagoon and golf course view with a private terrace and plunge pool that overlooks the water canals and natural mangroves. The spacious two level suites boast 1,324 square feet of space and include living and dining areas on the main floor. The bedroom, located on the second floor features one king bed and a large bathroom with a bathtub and rainfall shower. 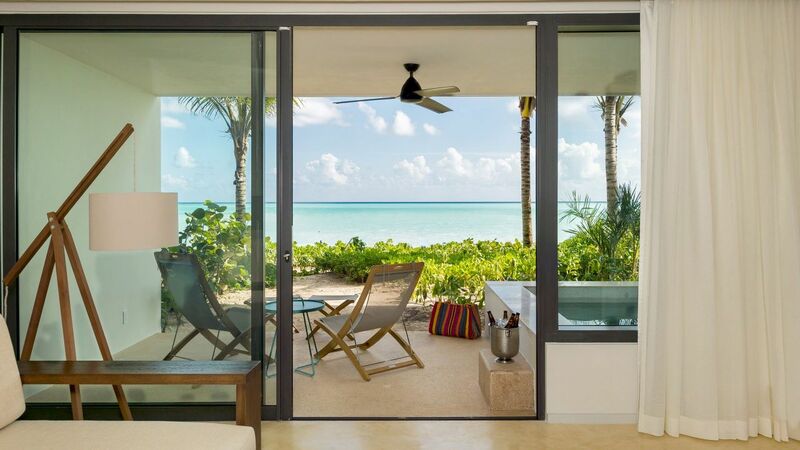 Each suite features a private plunge pool and views towards the Caribbean Sea. This vibrant 1,100 square feet suite offers one king size bed, expansive bathrooms and a lounge area. 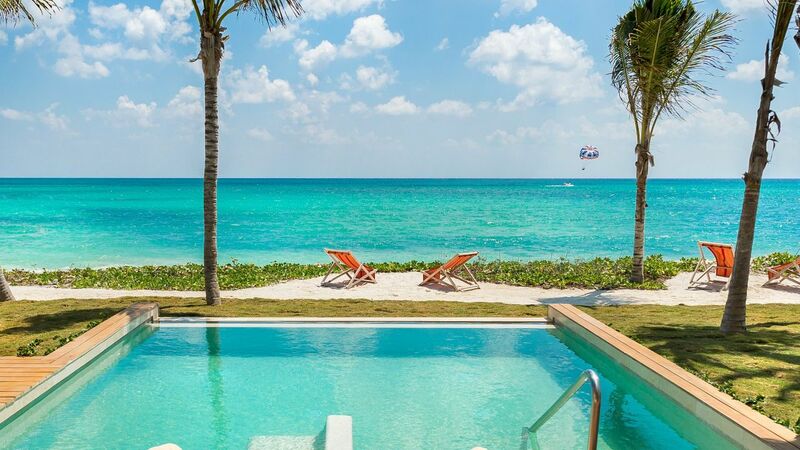 The terrace has a private plunge pool and overlooks the turquoise waters below. This is a premium suite. See World of Hyatt program terms for upgrade eligibility. 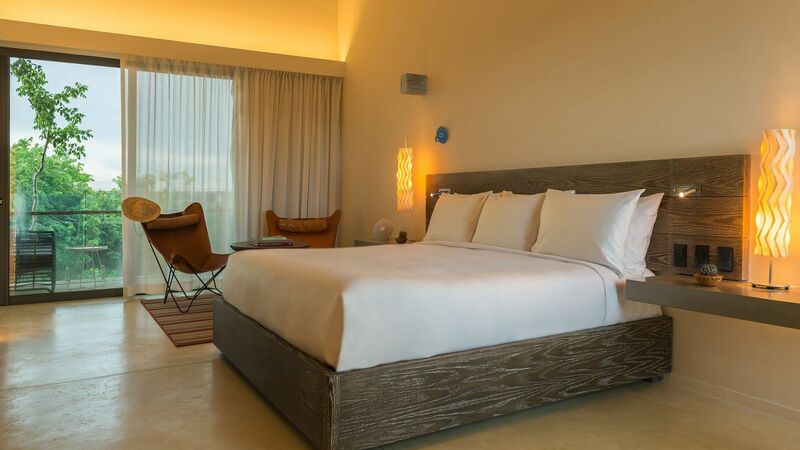 This vibrant 1107.61 square feet suite offers one king size bed, expansive bathrooms and a lounge area. The terrace has a private plunge pool and overlooks the turquoise waters below. The sprawling two level suites boast 1,324 square feet of space and include living and dining areas on the main floor. The bedroom, located on the second floor features one king size bed and a large bathroom with a bathtub. 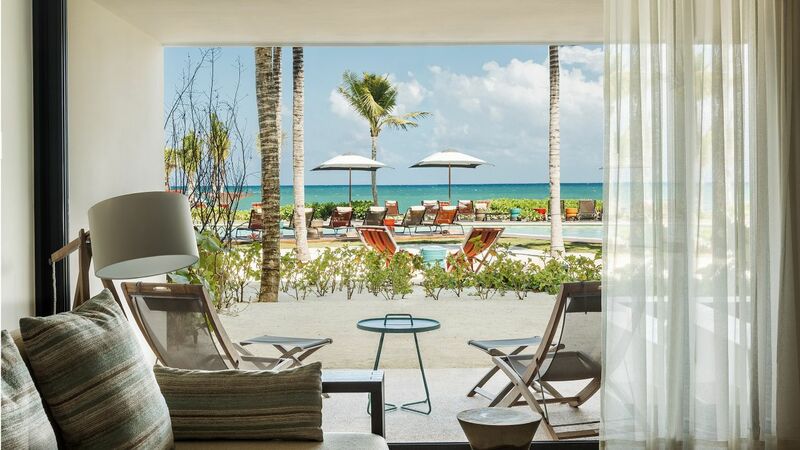 Each suite has unparalleled views of either the beautiful Caribbean Sea or the golf course each featuring a large terrace on the ground floor with a small private pool. This is a premium suite. See World of Hyatt program terms for upgrade eligibility. 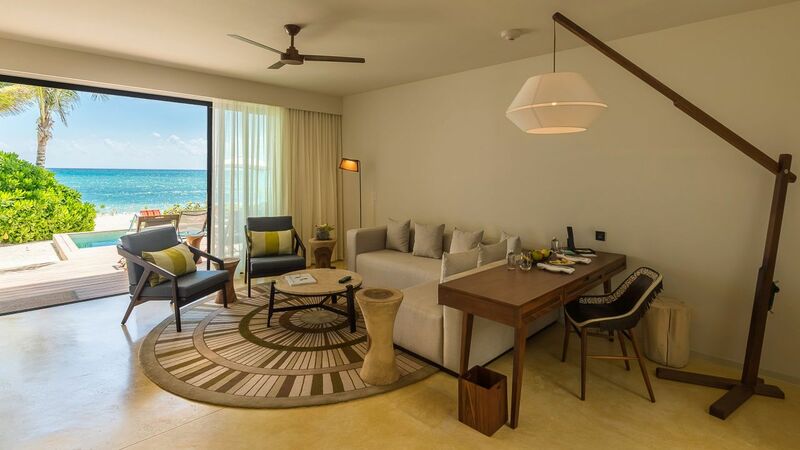 The 1,044 square feet Lagoon Suite includes one king size bed, expansive bathrooms, a living area and a private terrace. 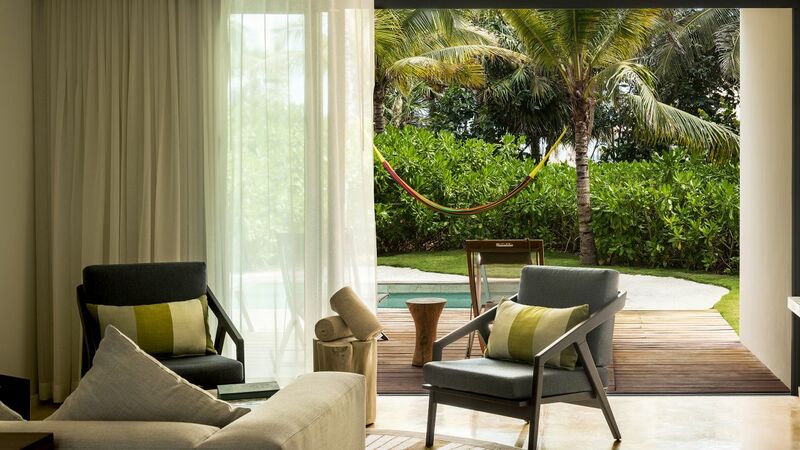 The terrace has a private plunge pool and views of the serene lagoon and natural mangroves. This is a standard suite. See World of Hyatt program terms for upgrade eligibility. This vibrant 710.42 square feet studio offers one king size bed, expansive bathroom with rainfall shower and a lounge area. The terrace has a private plunge pool and overlooks the turquoise waters below. This 810 square feet studio offers one king size bed, expansive bathrooms and a spacious living area. The terrace has a private plunge pool and overlooks the turquoise waters below. This is a premium suite. See World of Hyatt program terms for upgrade eligibility. 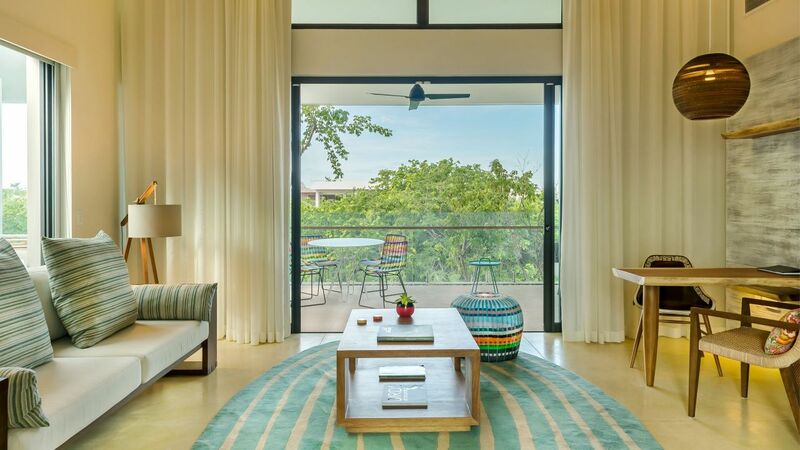 This spacious suite includes a living area, expansive bathrooms and a private, wheelchair accessible terrace. Located just a short walk from the beach, Beach Double rooms feature lagoon and golf course views with two double beds, private terrace and expansive bathrooms. 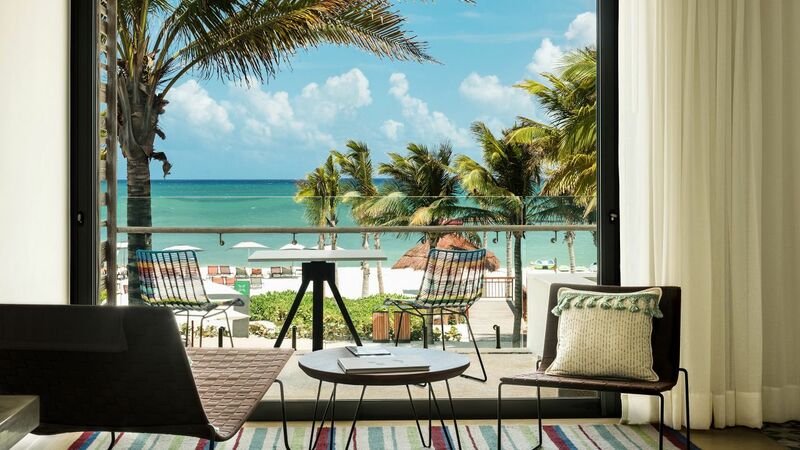 The vibrant Oceanfront Double includes two double beds, expansive bathrooms and a private terrace overlooking the turquoise Caribbean Sea. The stylish Lagoon View Double has two double beds, private terrace, expansive bathrooms and striking views of the serene lagoon and natural mangroves. 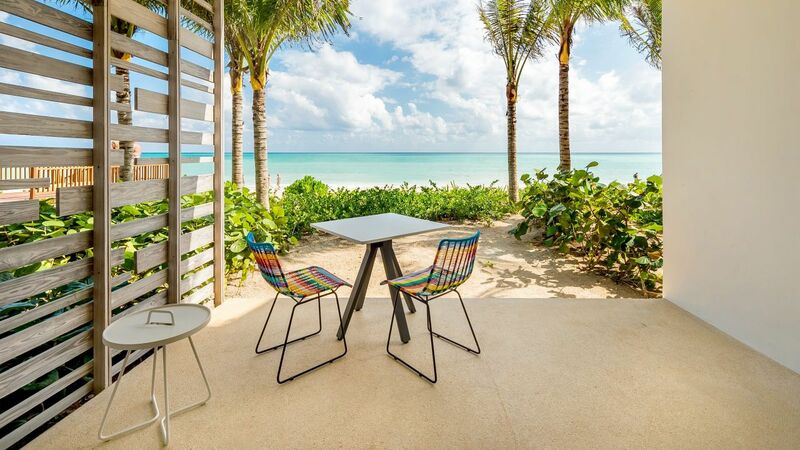 The vibrant Oceanfront Guestroom includes two double beds, expansive bathroom with rainfall shower and a private terrace overlooking the turquoise Caribbean Sea. 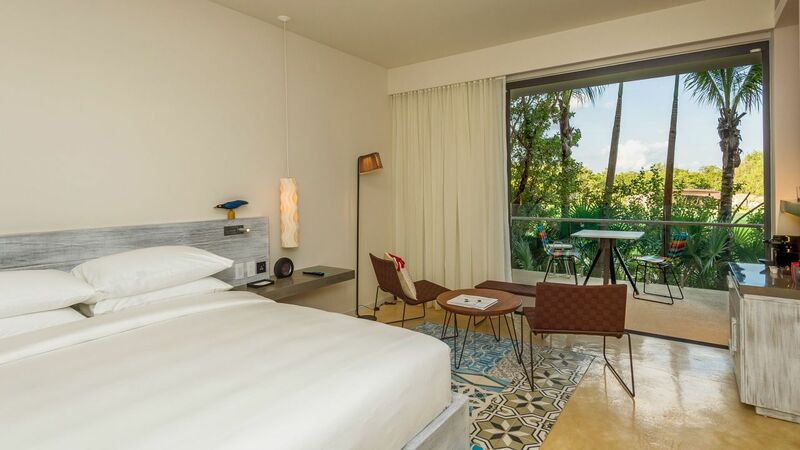 Andaz Double Guestroom includes two double beds, private terrace, expansive bathrooms and a tropical garden view. 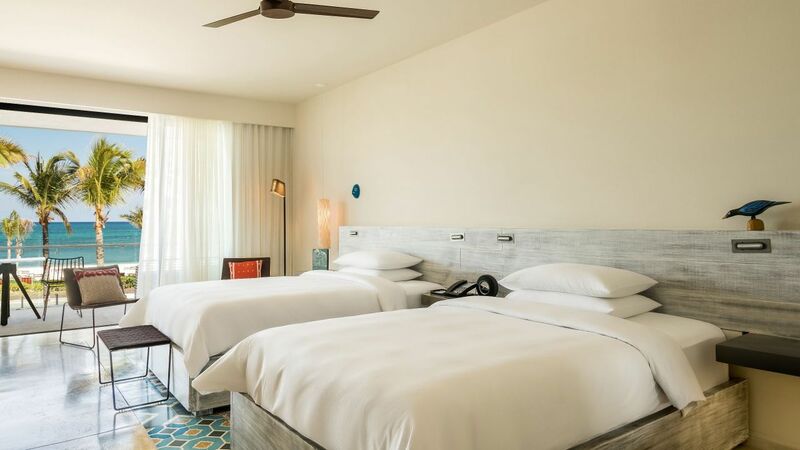 The vibrant Oceanfront Guestroom includes one king size bed, expansive bathrooms and a private terrace overlooking the turquoise Caribbean Sea. 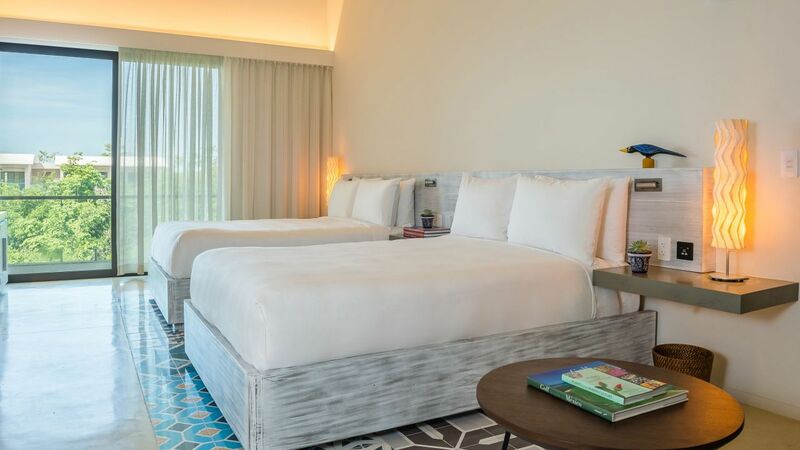 Located just a short walk from the beach, Beach King rooms feature lagoon and golf course views with one king size bed, private terrace and expansive bathrooms. The stylish Lagoon View King has one king size bed, private terrace, expansive bathrooms and striking views of the serene lagoon and natural mangroves. 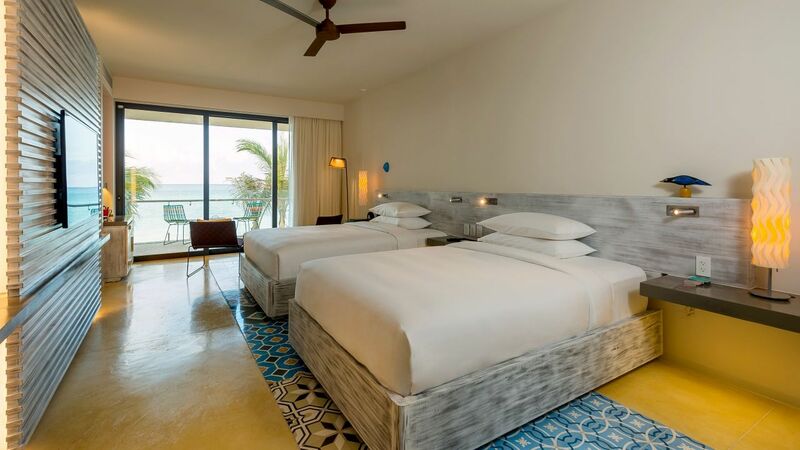 The vibrant Oceanfront Guestroom includes one king size bed, expansive bathroom with rainfall shower and a private terrace overlooking the turquoise Caribbean Sea. 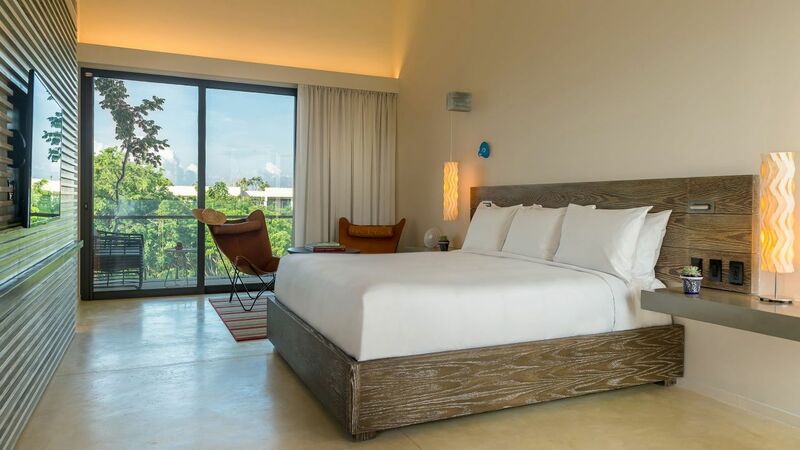 Andaz King Guestroom includes one king size bed, private terrace, expansive bathrooms and a tropical garden view.